Cooking on a budget and looking for cheap ramen meal recipe ideas? If you're vegetarian and on a budget (or just a lazy or busy college student cooking in the dorms! 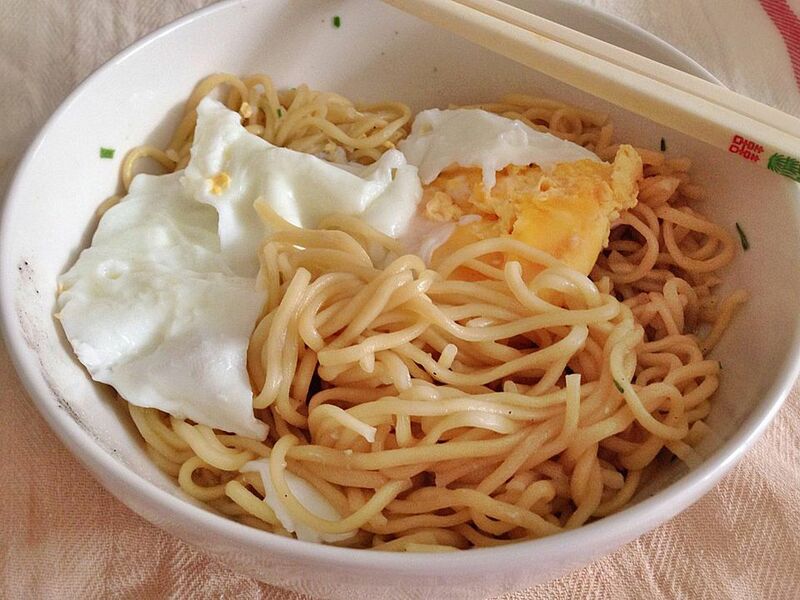 ), try this easy ramen noodle recipe with scrambled eggs. Or is it scrambled eggs with ramen? Wondering about whether or not vegetarians eat eggs? Here's more on the debate as to whether eggs are vegetarian or not. Scroll down for more vegetarian ramen noodle recipes to try. See also: Is ramen vegetarian? In a small bowl, whisk together two eggs and set aside. In a small skillet, bring water to a boil and add vegetarian ramen noodles and frozen veggies, stirring well to combine as noodles cook. Add olive oil and sesame oil and then the eggs, stirring well to scramble them with the ramen noodles. Add about 1/2 of the ramen seasoning packet or to taste, stirring well to combine.